Good Dinosaur: What Will Be Facebook's Adwords? What Will Be Facebook's Adwords? In the summer of 2004 I was interning at an NYC investment bank. We were all handed a booklet that contained the resumes of everyone in the program. Eduardo Saverin was part of our group and stuck around for about 2 days, deciding to abandon the corporate world in favor of his startup. On his resume, he had listed "Co-founder of The Facebook (thefacebook.com), an social network for Ivy league undergraduates that currently has 11 thousand members and is valued at over 6 million dollars. (I can't remember exactly so those numbers might be a bit off, but they are "ball park" close). A few short years later, Facebook is now open to the masses, recently surpassed 400 million members, and eclipsed Google to become the most visited site in the United States. Facebook did a great job to popularize itself. Mark Zuckerberg pitched his social graph thesis to gain interest and the creation of a developer's platform was an ingenious move. Facebook has made it in a big way. It has a larger user population than all of the United States by more than 100 million people. Think about that for a minute. If every man, woman, and child in the United States had a Facebook account (which most do), we'd still be short another 100 million people (so throw in another 12.5 NYC's and we are even stevens). Even more powerful, of those 400 million users, a large portion checks their account at least once a month, at a minimum. It is a large and sticky service. The company is reportedly on pace to produce between $1-$2 bn in revenue for 2010, which is fantastic, but I wonder what will be Facebook's money maker that puts their revenue engine in line with their customer and product achievements. A similar story was seen with Google. The search engine was beloved by all that used it, but it's monetization method was not easily found. Larry and Sergey reportedly attempted to sell it to Yahoo! for a few million dollars as this seemed like the most lucrative exit. It wasn't until their flagship advertising platform, AdWords, was conceptualized and implemented that the cash started to really flow in. Facebook is clearly beyond this point, but what will take them from a $1-2 bn dollar company to the place they should be for a service with their size and integration into our world. What will be Facebook's AdWords? Update: An article on TechCrunch points to a patent the company recently filed, which features a very global-esque looking virtual currency icon. 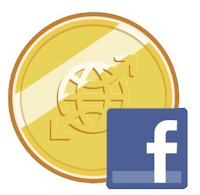 If all money continues to go digital, could Facebook become the banking or transaction platform of choice for the web? It is already the platform that many use to share pictures, plan events, and communicate.